In the latter years of World War II, the Nazi government employed a team of rocket scientists headed by German scientist Wernher von Braun to develop, build and launch the V-2 rocket. The rockets carried explosives and were capable of striking London from their launch site on the Baltic Sea, as well as from mobile launch sites. Adolf Hitler’s dream was to have one of these rockets or rockets that are more powerful deliver a nuclear bomb to Allied countries or to the United States. However, rocket technology was not that sophisticated yet, and it was too late in the war for the realization of this dream. 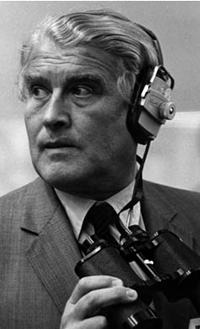 In the ending days of the war, von Braun led a group of scientists to surrender to the U.S. Army. With technical information and expertise, as well as captured parts from the Baltic launch sites, von Braun and his scientists began to work for the US Army in White Sands, N.M., to establish a rocket program. This program later relocated to Huntsville, Ala., where it’s now the site of NASA Marshall Spaceflight Center. The Soviet Union also captured some German rocket scientists at the end of the war and took them to Russia where they began a rocket program. 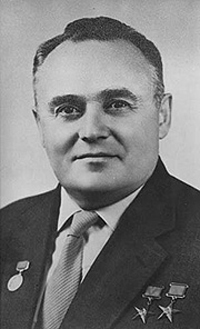 A brilliant rocket designer named Sergei Korolev headed the Soviet space program. Both von Braun and Korolev were accomplished scientists and were instrumental in the development of technologies for spaceflight. Their respective colleagues (captured Nazi scientists, American scientists, Soviet scientists) developed new rocket technologies and establish space programs in both countries. US rocket scientist Wernher von Braun, 1912 - 1977. Military leaders on both sides knew the potential of using rockets to deliver warheads across great distances and wanted such advantages for their own countries. Scientists realized the potential for using rockets to deliver satellites to Earth’s orbit to study the Earth, as well as use them for the exploration of outer space. As the rocket programs developed in both the United States and the Soviet Union, scientists from around the world joined together to designate 1957 as the International Geophysical Year, where they would band together to study the Earth. Both the United States and the Soviet Union had announced their intentions to launch satellites to study the Earth from orbit. The Soviet Union launched the first satellite Sputnik in 1957. The Soviets beat the United States in their goal. 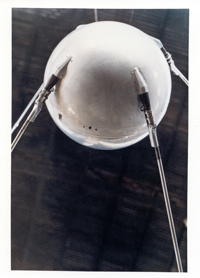 On October 4, 1957, they launched the first satellite into orbit, Sputnik I. The satellite had a 184-pound payload, much larger than that proposed by the Americans, and its radio signals could be heard around the world. It was a great achievement for the Soviet Union and was heralded as such by the communist government. After several failures, the United States finally placed the Explorer satellite in orbit on Jan. 31, 1958. Explorer I mapped the Van Allen radiation belts that encircle the Earth as part of its magnetosphere. The launches of these two satellites began the space race. The interest of the American public, a strong sense of national pride, the anti-communism atmosphere of the McCarthy era, and the need for America to maintain a technological edge and superiority all combined to create the space race. Fueled by the Cold War competition and tension between the United States and the Soviet Union, Americans and their leaders felt an urgency to catch up with the Soviets in space technology and to surpass them. It was a matter of national pride. In 1958, Congress passed the Space Act, which created NASA; the Soviet Union created a similar organization for their space program. The next logical step for both programs was to try to place a man in orbit around the Earth. Find out who achieved that goal first in the next section.